Now that will capture the imagination of consumers, conveying to them what a fun, on-the-go, game-changing device the DVBH is. Or is that the DH01? And this from the same company that brought us the fashion-forward, interestingly-named RAZR and MOTOKRZR cell phones. 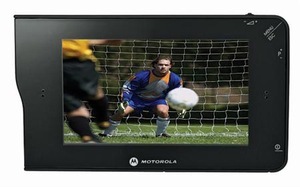 Motorola and rivals Nokia, Samsung, and LG Electronics already offer handsets with live TV capability. Apple’s iPod and iPhone let users download video to a computer and transfer them to to their mobile devices but do not support live TV. It’s Motorola’s first foray into devices solely devoted to mobile TV, which is gaining popularity but is still mostly in its infancy. The DH01 (yawn) is compatible with the DVBH (yawn) mobile broadcast standard. Verizon, the No. 2 U.S. carrier, began offering mobile TV services last year using the rival MediaFlo technology. The DH01 (yawn) has a 4.3 inch display and a feature that lets users pause live TV. Consumers can also add memory cards to store up to 90 minutes of video. It’s said to be the size of a paperback and will be available at the end of the month from television broadcasters, consumer electronics retailers, and wireless carriers. Now is that paperback a trashy romance novel or trade-sized? As with any new niche device, its acceptance will depend on price to purchase, quality of video playback, ease of use, and whether it gives TV fans a compelling reason to buy and carry yet another device for entertainment. We’ll see. But naming it the DH01 isn’t a great start.